UPDATE 2/4/19: No mystery now why the sudden appearance of an easily accessible photo to get Northam out. Lt. Gov. Fairfax who’ll succeed him is an ObamaProg….and Black! So much easier to be an effective instrument of “transformation” when you can hide behind Black skin. Trouble is, Fairfax has his own inconvenient baggage. 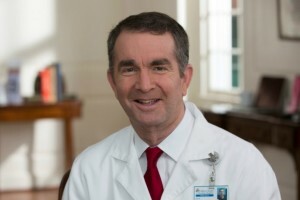 As of last week, Virginia Governor Northam was a shoo-in for a Michelle-Antoinette Hall of Shame profile for this calm, cool, collected, callous, horrifying call for abortion after birth, legalized infanticide. The doctor is IN with his virtuous Dem Party mates…so long as he’s flakking legalized infanticide and not showing up in an un-PC yearbook pose. As of this writing, he claims he WAS the blackfaced clown in that photo before he WASN’T the blackfaced clown in that photo. It’s also possible that this Norman Rockwell paragon isn’t the ruthless politician who ran this ad of his opponent heading up a Party of rednecks in pickups mowing down ethnic kids. Except he is, and he’ll be conveniently retired on the basis of his racism, not his candid abortion tell-all. A virus/poison/plague has entered the American bloodstream, and it’s not going away with the simple exit of one disgraceful (former) PEDIATRIC neurologist and professor of medical ETHICS from the political scene. One Response to Governor Ralph Northam of Virginia: Legalized infanticide? Yawn. Old un-PC yearbook photo? OMG!!!!! !